This brief article describes a frequency divider with VHDL along with the process to calculate the scaling factor. Therefore, the counter of the frequency divider generates the output signal of 200Hz each 250000 cycles. Without any more delay, the Listing 1 shows the source code for the frequency divider. Lines 1 and 2 are equivalent to the C/C++ #include or the Python import statements. The inputs and outputs of the system are declared between the lines 4 through 10. The frequency_divider process, lines 16 to 28, generates the 200Hz signal by using a counter from 1 to 124999. Why 124999 and not 250000? A clock signal is a square wave with a 50% of duty cycle (same time active and inactive); for this case, 125000 cycles active and 125000 cycles inactive. Since the counter begins at zero, the superior limit is 125000 - 1. The reset signal is an essential part in any digital system and its function in this component is to restart the counter. In order to verify what I just said, a test bench is generated with the aid of the Xilinx ISE 13.1 software. Luckily, the software creates most of the test bench itself. -- Instance of unit under test. reset <= '1'; -- Initial conditions. reset <= '0'; -- Down to work! Mechatronics Engineer, with a biased interest in digital systems design and development. 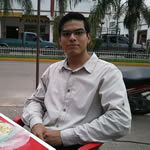 Currently studying Master's degree in Electrical Engineering and running a blog about digital design at Estado Finito. thank you for your perfect explaining.why we use not temporal as output? Motherf***** your code is not working. First of all, thanks for the download . I have just downloaded the code and tested it again under Xilinx ISE 13.4 and all is running correctly. However, sometimes the ISim simulator does not generate any of the input signals correctly and all signals are shown as undefined. Is this the case? Can you further describe the issue or check if a restart does the job? I don't know if this helps, but I was getting the same thing when I ran the simulation against uut - clk200 - Behavioral. All signals showed up as U. I told it to re-run all against it's parent clk200_tb - behavior and it worked correctly. Hey, Loren! Glad to see someone else runs into these kind of problems. Sometimes I also get only an ugly line of red fulll of 'U' and I solve it by restarting all the ISE and moving some simulation parameters. However, I still am unsure as to what the 'correct solution' to this error is (maybe it is just a bug in the ISE, maybe is something in my code, I cannot point it precisely). Thanks for your insights .